For Dallas listeners who got to know Bruckner’s Eighth Symphony through one of the many Karajan recordings made between 1957 and 1988, Jaap van Zweden’s tempo for the Scherzo must have come as a shock. Where Karajan takes a very measured tempo – some would say slow and ponderous – van Zweden takes off like a rocket. Who is right? 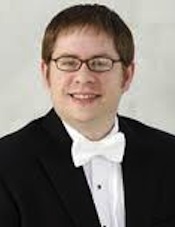 Well, for the record, the score is marked “Allegro moderato;” van Zweden clearly has the score on his side. It is interesting to note that in 1957, when Karajan made his first recording with the Berlin Philharmonic, there were several other versions available - one of them featuring Eduard van Beinum with the Concertgebouw Orchestra, in which van Beinum took a tempo for the Scherzo very similar to that of van Zweden in this concert. Coincidentally, van Zweden was concertmaster of the (Royal) Concertgebouw Orchestra for 18 years. Choices: Which Version of Bruckner's Eighth? Jaap van Zweden is a conductor who begins work on a score with the assumption that the composer knew what he/she wanted and that the conductor’s job is to convey it. In some instances - Bruckner (photo: right) being a case in point - determining what the composer wanted is not so easy. 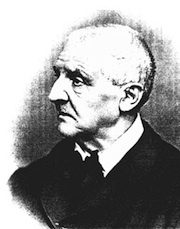 Bruckner revised his symphonies after their first performances, and often revised them again - not once, but many times. What is worse, some musicologists have argued that many of these revisions were prompted not by the composer himself, but rather by other musicians who thought they knew better. Some suggest that Bruckner was an insecure man, apt to take bad advice. Such a hazy history leaves the conductor with many decisions to make about which version of a given Bruckner symphony represents what the composer intended. There are no fewer than 34 different versions of the nine Bruckner symphonies. Bruckner completed his Symphony No. 8 in 1887, but set about to revise it when his friend, the conductor Josef Schalk, expressed serious reservations about the work. The revised version was completed in 1890. Most performances today use the Leopold Nowak edition (1955) of this revised version. As far as I could tell, this was also the version used by van Zweden. The Eighth is one of three symphonies in which Bruckner uses “Wagner tubas.” These are small tenor tubas (photo: right) played by four of the eight French horn players, who alternate between French horn and Wagner tuba in various sections of the score. The symphony is also unusual, especially for Bruckner, in that it uses harps. Actually, it is scored for only one harp, but in order to make the part audible, most conductors add a second harp or even a third, as van Zweden did for this performance. The harp(s) only play during the Trio (middle section) of the Scherzo and in the Adagio, but even with three players, there is a famous passage in the symphony in which they have little chance of being heard. In the Adagio, at bar 239, the biggest climax of the movement, Bruckner writes arpeggios for the harps while the rest of the orchestra is playing sustained chords at maximum volume (fff). Why Bruckner wrote such an absurdity we’ll never know. In this same bar there is another anomaly: cymbal and triangle make their only appearance in the entire symphony. After sitting for about 40 minutes, these musicians rise to play one note on their instruments, then sit back down again for another 40 minutes. For the record, the Dallas Symphony cymbal and triangle players executed their one note with consummate professionalism. Over the past five or six years. 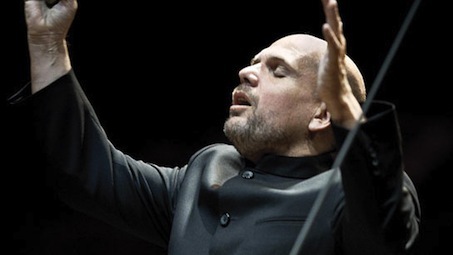 Jaap van Zweden has been recording Bruckner symphonies with the Netherlands Radio Philharmonic. Most of the nine have already been released, with the Eighth appearing later this year. It will surely be well worth hearing. Van Zweden is a wonderful Bruckner conductor: he loves the music; in long movements, he is able to maintain concentration from beginning to end. ; and he has a keen sense of how to balance an orchestra so that the massive brass chords don’t drown everything else out. Under van Zweden’s leadership, the Dallas Symphony Orchestra has moved from a very good orchestra to an excellent one - at home in a wide repertoire, built around a rich and stylish body of string players, and featuring outstanding soloists in every section. A few weeks ago they excelled in an historically-informed Bach performance and on this night they played Bruckner as if to the manner born, even though the DSO had last played the Eighth over twelve years ago (April, 2000). I was particularly struck by the sound of the Wagner tubas. Leading this tuba group was DSO associate principal horn David Heyde (photo: above right). He was brilliant. His cohorts played with absolute authority and - particularly in the Adagio - with a heartrending eloquence. I am told that the instruments used were purchased in Europe by DSO principal horn Gregory Hustis; if so, he did a wonderful job finding them. Kudos, as well, to the entire horn section for their fine playing in this concert and to Hustis for performing his many horn solos with distinction. A special salute is in order for the four gentlemen in the trumpet section. 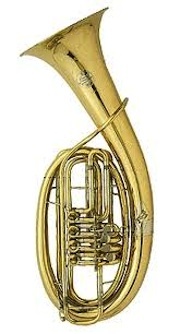 They were using rotary valve instruments, the type of trumpet we associate with German orchestras, which are particularly well-suited to the music of Bruckner because they are less brilliant and less penetrating than piston valve trumpets. Hearing them in Bruckner in the Meyerson, I really appreciated how effectively they blend with strings and horns without losing their distinctive sonority, especially in the lower register. That said, when van Zweden wanted power in the climaxes, they delivered that too. Finally, I need to applaud the members of the cello section for their beauty of tone and phrasing, especially in the slow movement. For the sake of transparency, I must declare a lifelong admiration for Bruckner’s symphonies. I have difficulty understanding why his music still meets with such widespread lack of appreciation in North America. Perhaps too many routine performances of his works have dulled their effect. Unfortunately, there are not many conductors who can make long (60 min. plus) symphonies cogent and compelling, and fewer still who can master the style and expression of a Bruckner symphony. Van Zweden can do both and one can hope that Dallas will hear a good deal more Bruckner over the next few seasons – it’s been at least 16 years since the Fifth was played by the DSO! Van Zweden begins with the printed score, but in the case of Bruckner, he finds far more there than do most of his fellows. Like all great conductors, if he becomes convinced that it will help the various episodes or phrases flow more naturally into each other, he frequently alters the tempo within a movement, even where there is no such indication in the score. The alternative is to mechanically beat time, and van Zweden is too good a musician to be mechanical. This sense of when to press on and when to hold back is one of the unwritten secrets of fine music-making. Music needs to breathe and to have shape. Van Zweden’s conducting of the Bruckner Eighth was filled with subtle changes in tempo and dynamics that brought out the depths of feeling in the music and gave each long movement a convincing unity. To my ears there was only one miscalculation. In the coda of the Adagio, the first violins play a deeply expressive melody on their G string with soft accompaniment from the other strings, horns and Wagner tubas. This passage is unbelievably touching and has the special quality of inwardness (innigkeit). I felt that van Zweden broke the mood by overdoing the crescendo in the horns. Earlier, I alluded to the role of the acoustics in the Meyerson. I really can’t say enough about what it means to have such a glorious hall, one that enables music to be heard at its best. The Dallas Symphony musicians perform on the best instruments money can buy but the sound they produce needs a space designed to enhance that sound. In the Meyerson Symphony Center they have that space and it is one of the finest concert halls in the world. One feature of this magnificent hall (photo: right) is that the basic sound – which is already superb – can be altered to suit the music being played. Above the uppermost seating level – the Grand Tier – is a reverberation chamber. The doors of this chamber can be opened or closed to alter the reverberation time. In the case of the Bruckner performance, the doors were opened wide to increase the reverberation time to almost maximum. Knowing that Bruckner spent much of his life as an organist in a huge cathedral, and that the sound of his symphonies has often been compared to the sound of a cathedral organ, most musicians believe that a cathedral-like reverberation is exactly what the music requires. A wonderful feature of the Meyerson is that while reverberation time can be increased, it can be done without loss of clarity. That is why this Bruckner Eighth was so special. There may be orchestras and conductors who can play the music as well as the Dallas Symphony and Jaap van Zweden, but few if any concert halls measure up to the acoustic enhancement of the experience provided by the Meyerson. There are two exceptional Karajan DVDs of Bruckner’s Symphony No. 8 available – both with the Vienna Philharmonic. The first of them (DG 00440 073 4395), filmed in 1979, is noteworthy for the fact that it was a performance given in St. Florian’s Church in Linz, the very church where Bruckner had been organist. It is also the most beautiful and intense performance of the Adagio I have ever heard. As is well-known, performing symphonic music in a huge cathedral is extremely difficult due to the long reverberation time and making a recording of such a performance is even more challenging. As was his practice in Bruckner, Karajan used two sets of timpani for this performance and in the finale they practically obliterate everything else. Karajan’s second DVD of the Symphony No. 8 (SonySVD-46403) was filmed at the Musikverein in Vienna, just a few months before he died. Although it is a much better recording than the first and features glorious playing, it is very slow and lacks the spontaneity of the St. Florian’s performance. 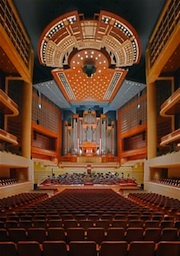 For more on the acoustics of the Myerson Symphony Center, I refer you to Laurie Shulman’s The Meyerson Symphony Center: the Building of a Dream, published in 2000 by the University of North Texas Press. I heard this done by a local college and they did a great job but nothing compared to the way you guys performed it. Great job!